*The Golden Retriever is a large breed of dog, historically developed as a gundog to retrieve shot waterfowl and upland game during hunting. As such they were bred to have a soft mouth to retrieve game undamaged and an instictive love of water. Their versatility sees them employed in a variety of roles including narcotics detection, search and rescue, as hunting dogs and very commonly, guide dogs. *The Golden Retriever is calm, naturally intelligent and biddable, with a patient demeanor and an exceptional eagerness to please. Among other qualities, their excellence with children has made them one of the most popular family dogs in the world today. *As the name suggests, the Golden Retriever really loves to retrieve. Whether it's a thrown stick, tennis ball, or flying disc, retrieving can keep a dog of this breed occupied and entertained for hours, particularly if there is water involved. 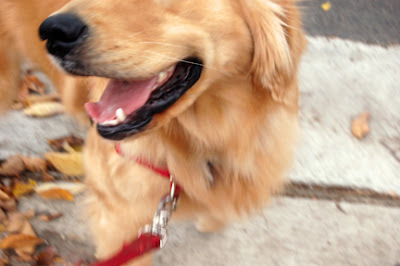 they might also pick up and "retrieve" any object that is near to them when greeting a human friend. *Goldens are also noted for their intelligence, and can learn up to roughly 240 commands, words and phrases.